At first glance, Canon’s Selphy CP790 snapshot printer looks more like a lime-green lunch pail. With its convenient handle, it begs you to take it to your next children’s party or family get-together. The trade-offs are a high purchase price and oddly designed, wasteful consumables. The 3.2-pound printer acts as the top-heavy lid of an oval bucket. Plastic latches secure the printer to the bucket. The bucket is divided into two compartments for storing the AC adapter, paper caddies, and supplies. To make the Selphy CP790 truly portable, you’ll need to buy the rechargeable lithium ion battery pack ($80). A Bluetooth adapter costs $50. The Selphy CP790’s top control panel consists of compass-style navigation controls and five logically labeled and intuitive control buttons. Menu items display on a 3-inch color LCD above the buttons. You can print directly from one of three media card readers or from a PictBridge-connected device. You can also transfer images via an infrared port on the front panel. You can connect the printer to a Mac via USB, but Canon does not include a USB cable. Once you install the printer driver on your Mac and select the Selphy in the Print & Fax system preference, it is ready to go and can print from various sources like Preview, Photoshop, and iPhoto. The Selphy CP790 needed about a minute to print one 4-by-6-inch photo in our tests, which is similar to Canon's Selphy CP770 ( ). If you get antsy, you can be mildly entertained by seeing a yellow, cyan, and magenta version of your photo as it prints. Be careful though—the uninitiated would be tempted to grab the photo as it peeks through the back of the printer before it’s actually finished. Print quality was mostly good: Grayscale photos and portraits with various skin tones looked natural, but landscape shots were excessively yellow and lacked detail. The dye-sublimation technology of the Selphy CP790 is distinctive—but not in good ways. The paper-tray design is clumsy, for one. The printer’s two cassettes hold postcard- or credit card-size paper (18 sheets maximum). The cassettes’ double-layered, clear plastic lids require juggling: To load paper, you lift both lids; to insert the cassette into the printer, you replace just the inner lid, while the exterior lid acts as the output tray. The printer’s ink cartridge only has an estimated capacity of 36 printouts, making it a pain to switch out ink so frequently. 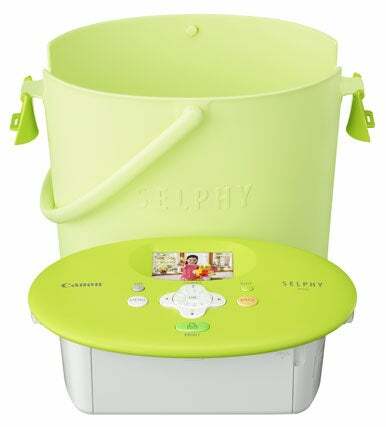 The Selphy CP790's bucket is used to store cables and supplies. The design of the dye used for printing is wasteful, too. It comes in rolls of film, containing successive sections of cyan, magenta, and yellow, plus a clear finishing coat to protect the photo’s longevity from normal wear and tear likes spills and heat. During printing, each section of color passes over the paper and then rolls up for disposal, regardless of how much might be left. Also, you need dedicated rolls for each paper size. Canon doesn’t have a recycling program for these plastic-encased dye supplies, though curiously you can recycle the printer itself by sending it back to Canon with a check for $12. At least the consumables costs are tolerable. A five-print starter kit with postcard-size photo paper comes with the printer. A 108-sheet replacement kit costs $35, or a respectable 32 cents per print. A 36-print kit is only $15, but its 41.6-cent per-print cost makes me wince. The Selphy CP790 succeeds in being portable, capable, and even amusing. Still, the awkward paper handling and plastic-intensive ink cartridges are design drawbacks. Given that there are better printers in terms of photo quality, ease of use, and convenience, the Selphy CP790 just barely makes par.